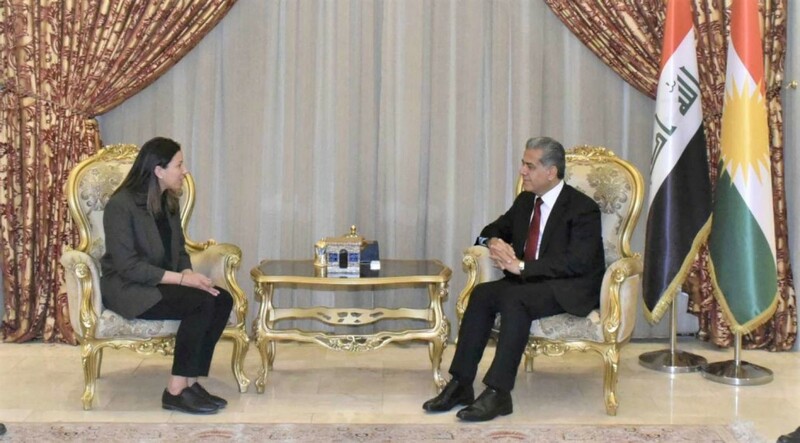 Erbil, Kurdistan Region, Iraq (dfr.gov.krd) – Minister Falah Mustafa met Ms Tanya Evans, the newly appointed Iraq Country Director of Mercy Corps, an international humanitarian NGO. Minister Mustafa, Head of the Kurdistan Regional Government Department of Foreign Relations (DFR), welcomed Ms Evans in her new role as the country director, saying that the DFR and other KRG institutions work hard to maintain ties with partners and facilitate the important work of NGOs in the Region. Minister Mustafa thanked Mercy Corps for their humanitarian assistance to displaced persons, in particular for their important work of empowering women and children living in camps. He said “The KRG is committed with the international community to provide services and an effective response to the basic needs of refugees and IDPs including food, education, and health, and to help them to return to their original homes”. He also briefed Ms. Evans on current developments in Kurdistan and coordination mechanisms with humanitarian and international organizations, Erbil-Baghdad ties and the formation of the new KRG cabinet. Ms Evans said that Mercy Corps’ goal is to empower young people through education and helping them to return to their homes. She looked forward to strengthening cooperation with the KRG. Mercy Corps has been working in Iraq since 2003, implementing relief and development programs much of them focused on refugees and displaced persons.